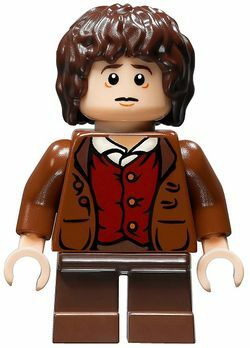 Frodo Baggins is a minifigure from the theme The Lord of the Rings first released in 2012. He is one of the main characters of the theme, and appears in five sets. Frodo's Shire variation, which is seen in 9469 Gandalf Arrives set and in 30210 Frodo with Cooking Corner polybag has dark brown short legs and a sand green torso. His torso is printed with suspenders, a belt and several buttons. His arms are also sand green and his hands are light nougat. His light nougat head has on one side, a cheerful, smiling expression and on the other, a slightly worried look. He has brown eyebrows and curly dark brown hair. There are two versions of Frodo used when he is adventuring which almost the same apart from the fact that they have different cloaks. 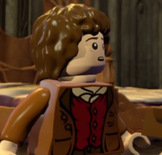 The Frodo that appears in 9470 Shelob Attacks has a dark stone grey cloak while the one that appears in 9472 Attack on Weathertop has a earth green cloak. This is because the Fellowship got new cloaks after leaving Lórien. Frodo has dark brown legs and a reddish brown torso. His torso is printed with a reddish brown coat, a dark red waistcoat and a ivory tunic. He has reddish brown arms and light nougat hands. The head in his regular outfit features bags under Frodo's eyes which represents the weariness of his journey. One side of his light nougat face has a grim expression and the other has a terrified screaming mouth and pale blue eyes. He has brown eyebrows and curly dark brown hair. A fourth variation in 79006 The Council of Elrond, features the same legs, torso and hairpiece as the variations included in 9470 Shelob Attacks and 9472 Attack on Weathertop, but does not come with a cape and uses a different head. One side of his light nougat face has an angry expression and the other has a worried face. Frodo appears in 850517 The Lord of the Rings Magnet Set alongside Samwise Gamgee and the Ringwraith. His regular appearance has him wearing his grey Elven cloak and carrying Sting. The legs and torso are glued to a magnet brick. In 850681 Frodo Baggins Magnet, the regular outfit is the same as the previous magnet set but this magnet has Frodo wearing his green cloak. His entire body except the arms is screwed to a round magnet that has a background image of the Shire. The 850674 Lego The Lord of the Rings Frodo Baggins Key Chain has Frodo wearing his Shire variant and sporting a worried look on his face. A metal chain with a round key chain ring is permantely screwed onto his head. Frodo goes barefoot just like all the Hobbits in the game unlike their physical appearance. He has the ability to enter small doors and possessing The One Ring which, when worn, can enter Ringwraith mode. 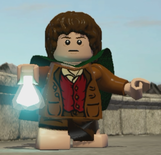 Frodo also receives several items throughout story mode including the Elven sword Sting that glows blue when enemies are close, a Mithril shirt that covers his health hearts in mithril which doubles the health, the phail of Galadriel to use when entering dark areas and an Elven cloak to hide from enemies. His Shire variant although the same as seen in the Gandalf Arrives set and Cooking Corner polybag does not carry any weapons nor items. The regular outfit has Frodo wearing his green cloak and is sometimes seen without during the cutscenes. The Mithril outfit that appears in the handheld consoles and iOS version reveals the mithril shirt underneath his regular outfit. In the cutscene where Shagrat and Gorbag take him to the tower of Cirith Ungol, Frodo was held captive and his belongings were taken from him. The head is the same as the Weary variant. 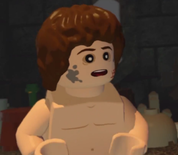 His nougat torso does not have the wounds from carrying the Ring around his neck nor from getting stabbed by the Witch-King and it's the same torso from LEGO Harry Potter: Years 5-7 that was seen in the Locket variants of Harry Potter and Ron Weasley. He has short dark brown legs with light nougat feet. The Orc disguise that he wears over his Weary variant has him wearing the armor torso from the video game variant of the Mordor Orc, a helmet that resembles a bird's beak and dark brown gloves. Frodo wears his Weary outfit twice in the levels Cirith Ungol and Mount Doom. His light nougat face is wearier because of the dark circles around his eyes, dirt spots and a wound on one side of the cheek. The shirt is the same as his Shire variant but in a different color with a few stains and part of it hanging loose. Frodo Baggins was a Hobbit of the Shire. His uncle Bilbo Baggins had went on an adventure 60 years earlier, and found the One Ring in the creature Gollum's cave. The Ring passed onto Frodo after Bilbo's 111th birthday party. After learning that the Ring was the most powerful weapon of the enemy, the Dark Lord Sauron, Frodo was tasked by the wizard Gandalf the Grey to immediately leave the Shire (with his gardener Samwise Gamgee and his friends Merry and Pippin) and head for the The Prancing Pony in the village of Bree. Soon he met Aragorn, who headed for Rivendell with the Hobbits. There it was decided, Frodo had to take the Ring to Mordor. He was joined by his three Hobbit friends, Aragorn, Gandalf, Gimli, Legolas, and Boromir. After losing Gandalf, the Fellowship was broken. Frodo and Sam left for Mordor, alone. The creature Gollum became the Hobbits' guide, leading them to Mordor. After a long series of adventures, Frodo finally destroyed the Ring. Four years later, Frodo departed to the Undying Lands, from the Grey Havens, with Bilbo, Gandalf, Elrond, Celeborn and Galadriel. Frodo Baggins of Bag End, like most Hobbits, is not easily affected by magic - good or evil. Frodo volunteers to carry the One Ring to Mordor, cast it into Mount Doom and destroy the One Ring forever. He soon feels the terrible powers of The Ring, and all the dark creatures who hunt him in their search for it will do anything to claim the One Ring for themselves and leave Middle-earth in darkness. It is hard for a very small person to carry such a heavy burden. Frodo will need all the help he can get from his friends in the Fellowship. He must summon all his courage, endurance, kindness, and strength, because even the smallest person can change the course of the future. He has a double-sided face in all of his variations. Frodo has a new hairpiece used in various colors for all the Hobbits. He has a new kind of sword that is based on Sting, the magical Elven blade his uncle Bilbo gave him. Frodo™ Frodo Baggins of Bag End, like most Hobbits, is not easily affected by magic - good or evil. Frodo volunteers to carry the One Ring to Mordor, cast it into Mount Doom and destroy the One Ring forever. He soon feels the terrible powers of The Ring, and all the dark creatures who hunt him in their search for it will do anything to claim the One Ring for themselves and leave Middle-earth in darkness. It is hard for a very small person to carry such a heavy burden. Frodo will need all the help he can get from his friends in the Fellowship. He must summon all his courage, endurance, kindness, and strength, because even the smallest person can change the course of the future. This page was last edited on 12 January 2016, at 22:49.